I am an olive fan and I love that “olive” sounds like “I Love”. Did you know if you mouth “olive juice” it looks like “I Love You”?!! Know what else, “Olive”? Red beans. Yes, I’m talking red beans on a Friday and not on the traditional Monday. O.k. enough of this crazy talk, it’s time we get down to business. The business of football. Yes, the big Saints playoff game this weekend! It is definitely “WHO DAT” nation down here in Louisiana and “Olive” it. Nothing can bring a bunch of folks together more than a common goal of the Super Bowl. For the last few weeks, both silent and loud “WHO DAT” chants are heard anywhere from elevators and office cubicles to street corners and grocery stores. The “WHO DAT” chant is like a vocal wave. One fan says it and anyone within ear shot follows the lead. It is quite a bonding experience, like a secret handshake. Besides being die-hard Saints fans most Louisianians have another thing in common. We all at some point in time have a frozen container of red beans in our freezer, which brings me to my football game appetizer: Olive Red Bean Relish. It is a quick and easy way to turn those leftover red beans into a “Super” snacking Sunday success. 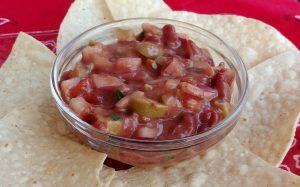 This relish or “dip” as hubby refers to it, goes great with just about anything and, extra points, you can make it before the game which already eases some game day stress. Geaux Saints! Pour vinegar over diced red onion. Let sit for 10 minutes. Whisk in the oil. Mix thoroughly with the remaining ingredients. Cover. Chill for at least an hour or overnight. Garnish with green onions if using. Serve chilled with chips, boiled shrimp, or cooked sausage. Put Your TO COOK IS TO CREATE Thinking Cap On: Still have some leftover red beans after making this relish? Make Coconut Curry Red Beans over Cashew Rice Cakes No red beans? Works with leftover white beans, too, and if you happen to have leftovers make a White Bean Shrimp Salad. Are you a fellow olive fan? Add a mixture of olives. Not an olive fan? Substitute diced pickled okra, dill relish, or capers. 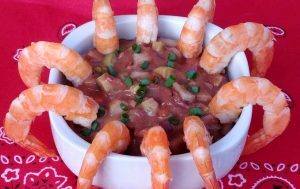 I love to serve boiled shrimp with this relish and I suggest chips or sliced cooked sausage, but what else could you serve with it? How about toast points, fried okra, cornbread sticks or chips, or even fried chicken strips? No red onion? Use white or yellow onion or even a shallot. Do you have any meat in your beans? No? Add diced cooked sausage or ham. Like it spicy? Added diced jalapenos. Think about what seasonings are already in your red beans and adjust accordingly. FOOD FUN: Here’s a little something that will make your football food eating Sunday a little bit better. Did you know that olives are technically classified as a fruit? “Olive” that!! Bring on my fruit serving. This has Bill Hunts name all over it! And I have just the right amount of leftover red beans in my freezer! Making this! Yeah!! Bet he’ll love it, your brother sure does!